The building was conceived entirely on the basis of the requirements of an opera seria. This does not mean that other forms of use were not possible. 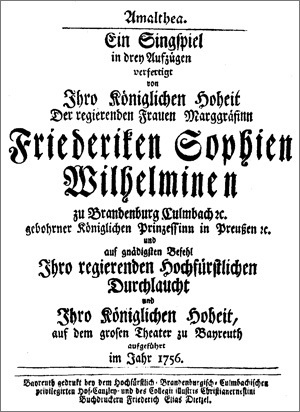 A report of the wedding celebrations of Princess Friederike and Duke Carl Eugen in September 1748 indicates that, in addition to opera seria, a wide variety of festivals and theatrical performances could be held within its walls. In the description of the opera house that he wrote in 1800, Counsellor of Justice Sebastian König records that in order to make the floor in the stalls the same level as the stage, "the whole floor [was covered] with boards supported on trestles […] which took a lot of time and effort, and was still not very stable" . The Munich Cuvilliés Theatre, which was built a little later, opted on the other hand for the costly solution of a mechanical lever system, by means of which the entire floor could be raised to the level of the stage. The "drama per musica", which is today called opera seria, was by its very nature the form of baroque performance for which the building was best suited. Opera seria had replaced the colourful spectacle of the "Italian opera" towards the end of the 17th century as tastes changed due in large part to the influence of Louis XIV. The new type of entirely serious opera fitted in very well with the heroic world of absolutism that had spread throughout Europe. The material from ancient mythology and history was presented without complicated side plots by a limited number of performers. The plot usually bore reference to the heroic light in which the rulers of the day were seen, so that opera seria became the standard form of opera at 18th-century courts. 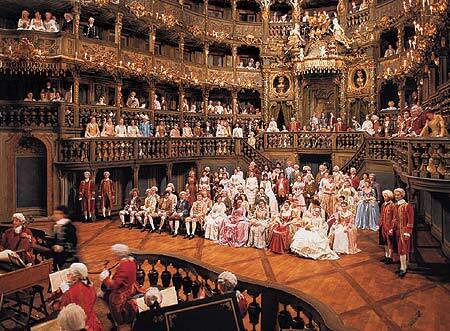 Its growth in popularity was accompanied by the building of new court theatres of hitherto unknown splendour. Two examples of this form of opera that were performed in the new Margravial Opera House were "Il trionfo d'Ezio" and "Artaxerxes". The high standards established in Bayreuth are reflected by the fact that the music was by Johann Adolf Hasse, who together with Handel was the most important composer of operas before Mozart, and the libretto of "Ezio" was by Pietro Metastasio, one of the most productive librettists in operatic history.